← What I’m loving now. Larry and I have gone to Tavern Hall in Bellevue twice and both times the food and service were great. It’s casual bar food, but done very well. The burgers are very good, although they are thin. I prefer the burger at Cheesecake Factory or Ruth Chris, they both have thick burgers that they will cook medium rare, but Larry raves about the burgers here. What we both loved were the sesame wings. 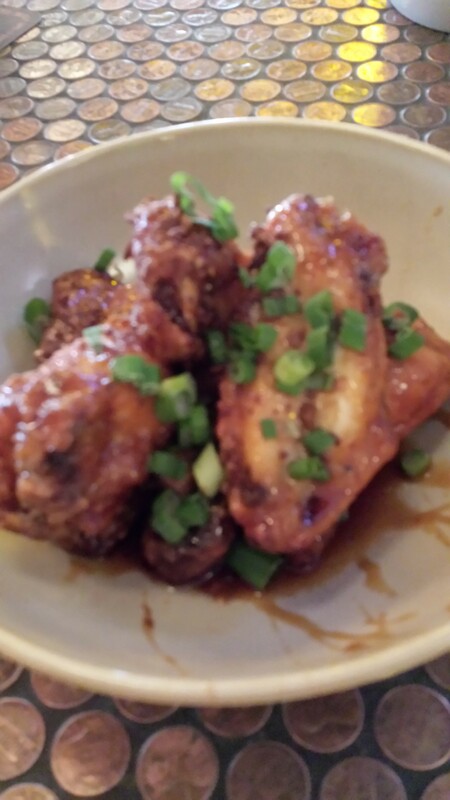 These were the best wings I’ve had in a long time. Although I think $10 for 5 wings is steep. I had the chicken and waffles. 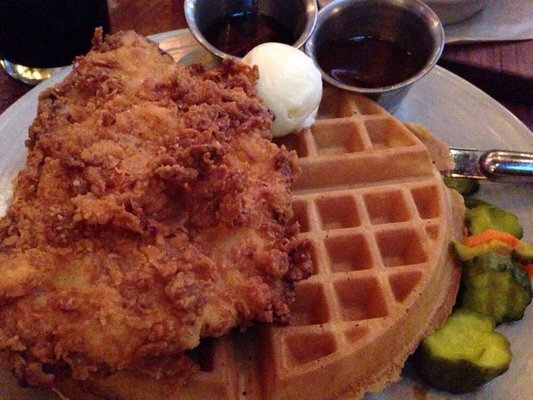 The waffles were sweet and the chicken was delicious. They brine the chicken first and you could tell. The coating was slightly salty. the combination was great. Marathon training is starting to build. I have a mid-week 7 miles to run, these are always so hard for me. 7 or 8 miles before work is rough. My mid-week runs are definitely getting faster. I’m averaging about 9:15 minute miles which is great. I’m thinking about running a 10k to see how I do. I have had very good luck with weekend running buddies, thanks to Linda, Danelle and Laine. Hopefully that will continue as the big miles are just beginning, this weekend I will be running 15. My next race is the Hot Chocolate 15k. It’s very large due to the chocolate handed out and the great swag. No shirts for this race, each year it has been a nice sweatshirt/jacket of some kind. Any tips for long mid-week runs? What’s your next race? This entry was posted in Uncategorized and tagged Hot Chocolate Race Seattle, Marathon Training, Tavern Hall Restaurant. Bookmark the permalink.